“I love old cemeteries! Not only do they serve as sacred grounds to hold bodies, once temples of the Holy Spirit, they are filled with wonderful memorials. I am grateful to the many volunteers that have spent hours transcribing stones in the oldest parts of several Albany Diocesan Cemeteries where records no longer exist. That information will become accessible to the public soon. To answer the question of what information we have available now for genealogists, I invite you to visit me in my office at St. Agnes Cemetery, Menands for a Historian’s Open House”. Copy fees for requested records will be waived during open house. 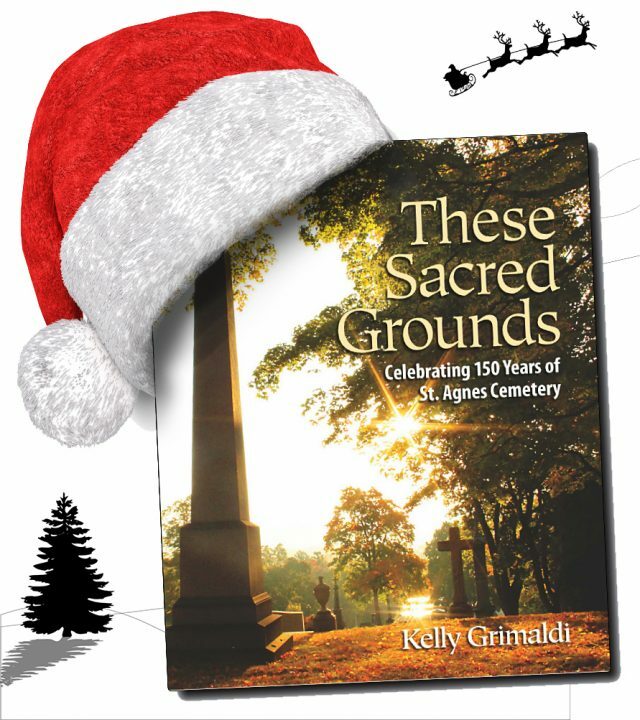 Two lucky visitors to the open house will win a copy of These Sacred Grounds, a beautiful coffee table book about Historic St. Agnes Cemetery. Do you do this at any other time of the year? I live in Florida. My parents ans sister r buried in Most Holy Redeemer. My great aunt and uncle and daughter(?) and possibly grandfather are buried in Old St. John’s. I was working with Mr. Moutain when I was up there two years ago. The O’Neill’s are related to me somehow that I have yet to figure out. My aunt, uncle and cousin are all buried in St. Agnes (Carey”) Joseph, Eleanor (Leonard), Matthew and his aunts Helen, Elizabeth and Marion). Sorry i got so wordy. Thank you for a reply to my initial question. You can always give Kelly a call and she will be happy to answer questions. This sounds like a wonderful time! Very informative! Would love to go! Is registration necessary? No registration needed. We hope to see you there.